Hello, fellow Wealths. I see you’ve done well for yourself, what with capital gains and all, moving beyond horse dancing and into rhino waltzing. I, too, have moved on to stratospheric new heights, ditching my Aston Martin car for peasants and poors. I am in my new Aston Martin boat. That is a picture of me. Cars really are so limited, aren’t they? They are stuck on the land, which is full of dirt and also people. True freedom is on the water, which is full of water and fish. Fish are my only friends. Why, I have long dreamed of establishing my own lawless post-tax utopia out on the water for myself and other members of the libertarian tech industry thought-leader class to live on, but that is neither here nor there. Cars also have price tags. 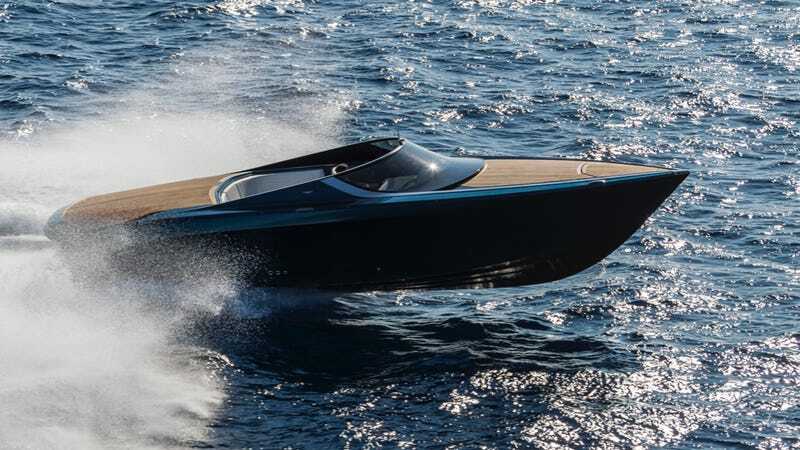 My Aston Martin AM37 boat does not. Your car has a convertible top? My Aston Martin boat has a convertible bed. And also a convertible top. What’s more, you can close everything off at the end of the day, ensuring protection against the elements and uninvited guests. Your car has a throttle? My boat has two throttles. My boat has a champagne cooler. My boat has air conditioning (optional). My boat has Bravo Three XR sterndrives, coupled to everything from twin 370 horsepower diesel engines to 520 horsepower gasoline engines. Diesel is dirty, which is why it’s the cheapest. Nothing in my life is the cheapest. My kitchen is even top-notch as well, featuring nothing but the finest microwave, Nespresso machine, and minifridge. You can’t handle my minifridge. Inside you will find vials of youth-blood and other chemicals I use to defy my own mortality. My boat will look like a shiny metal rainbow. Just like rainbows in real life. Oh, you can’t see me?